Def Leppard played a private show for the McAfee Focus 14 conference last night in Las Vegas, NV with a 14 song set played. The band played a 90 minute set at The Joint At The Hard Rock Hotel. Their first show here since VIVA! Hysteria in April 2013. The show started with the opening of the red curtains and 'Won't Get Fooled Again' before the band went into the usual 14 song setlist as played during the KISS tour. No changes from the one played in Houston, TX on 31st August - the last show with KISS. A smaller scale lighting rig was used and no on stage video screens. The venues own side screens (as seen in VIVA! Hysteria) were used. Joe made a short dedication to Vivian after 'Rocket' was played in place of the usual pre-'Armageddon It' Vivian intro. 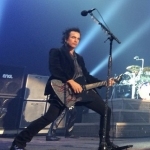 This was the first full show with guest Steve Brown on guitar who is standing in for Vivian Campbell while he undergoes Stem Cell treatment at a hospital in California.